The Polynesian sailing canoe Hokule'a was in sight of Rapa Nui this morning, and was readying to make landfall on the island. 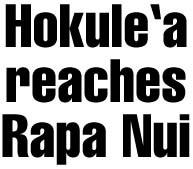 Myron Pinky Thompson, president of the Polynesian Voyaging Society, told the Star-Bulletin that the canoe was 10 miles off shore early this morning, and the crew was working out the protocol with Rapa Nui officials and dignitaries to set foot on the island. Thompson said master navigator Mau Piailugs nephew, Max Yarawamai, and Bruce Blankenfeld were the first to spot the island at about 1 a.m. Hawaii time. Yarawamai and Blankenfeld at first were not sure if what they were seeing was an island or clouds. But on closer inspection they realized they were seeing the top of Mount Terevaka. 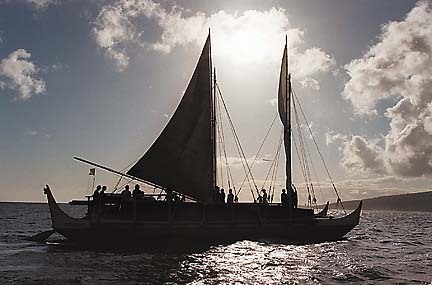 The Hokule'a, Hawaii's first traditional voyaging canoe and symbol of native Hawaiian resurgence, set sail for Rapa Nui from Hilo June 15. "I'm relieved and excited, but I knew that we were going to do it," Thompson said. He said his son Nainoa said the crew was well and elated. 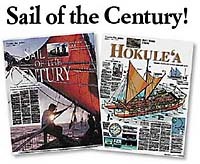 This last sail of the century will complete the triangle of ancient migration routes the Hawaiians have retraced through the Pacific. It also ends on shores with a tragic history, perhaps most in need of spiritual guidance and restoring Polynesian pride.